When we were young, the first and only man we ever looked up to was our dad. We considered him to be our Superman because even after work, he would still spend time playing games with us, share stories and even help us with our homework. On certain weekends, he would always find time to spend with us or even treat us out to our favorite fast food restaurant. But growing up, we spend less time with our fathers as we get caught up with schoolwork and as we start working. We are no longer the little boys and little girls of our dads who used to spend time flying kites with him on a windy afternoon, nor listen to his bedtime stories. This Father’s Day, treat the best man in your life to a day that will create new sweet memories with your father.Wake up extra early to surprise your dad by cooking his favorite breakfast and to make it extra special, serve it in bed. Go out and watch the action-packed Man of Steel with your Superdad in the afternoon. Enjoy dinner in his favorite restaurant and have that long conversation you used to have. Before the day ends, reminisce on the good old days with your father over a slice or two of cake, the same way he would treat you on your special days. This weekend, say thank you to your Superdad with a limited edition Red Ribbon Father’s Day Black Forest Cake, available in all Red Ribbon branches from June 15 to 16, for only P550. Bring back the good times and surprise him with a treat that will bring back sweet memories you’ve shared with him in the past, be it an old Father’s Day, your graduation, a new job or for winning in a school contest. 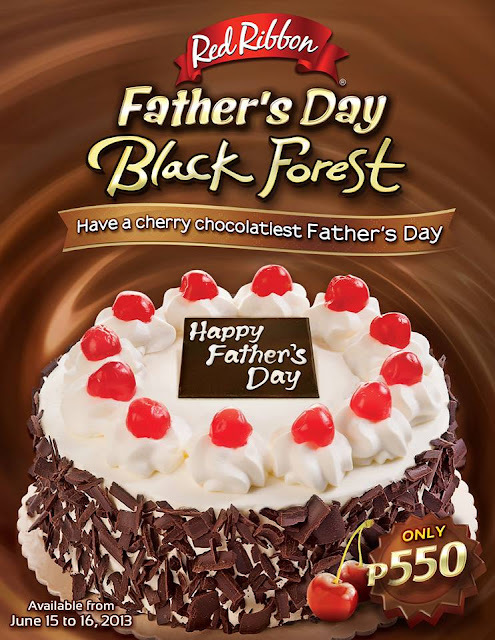 Give your dad the cherry- chocolatiest Father’s Day celebration with Red Ribbon’s chocolatiest Black Forest with a cherry twist, made with moist chocolate cake filled with cream and cherries and topped with chocolates and cherries. This Sunday is a special day for your hero—your dad. Make him remember that even though you may be taller and wiser, you’re still his little prince or princess who enjoys a Black Forest Cake the same way he does. Isn't this wonderful? Don't waste any moment! Go rush to the nearest Red Ribbon store and get your own Black Forest Cake for your dad! Oh, how I love Red Ribbon!